You and your team have to live with the impact of poor internal quality every day, on every project. But fixing these issues or improving the situation is not often a top priority. “No one keeps track of the costs of (internal) poor quality…Drop revenue or market share by a few percent and you’ll have the attention of the board of directors.” Hope Happens, Linda Hayes. However, do you need to wait for someone else to fix it for you? Or is there something that you and your team can do to help yourselves? 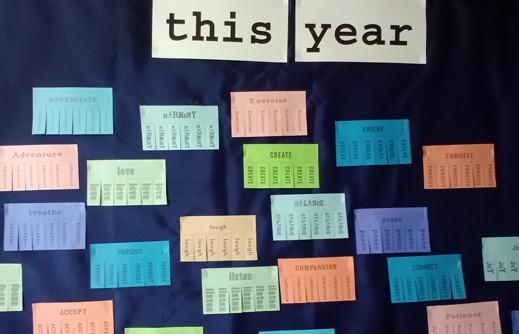 The beginning of a new year is a time for some to set goals for self-improvement. Why not borrow from this idea for your own project team? Why not tackle some process improvement this year? The word ‘process’ can conjure images of red tape, scrutinizing audits, stacks of paperwork, meeting after meeting, multiple approval levels, etc. But is this what process is supposed to feel like? In both of the above cases, a ‘process’ is expected to produce ‘something’ through ‘action’. It is most likely that the ‘something’ could/should be evaluated in terms of quality attributes and the ‘action’ will need to be effective and/or efficient in producing the ‘something’ to a standard of quality in order to be successful. 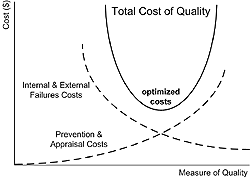 Therefore, the total cost of process in an organization can be similarly modeled as the Total Cost of Quality (of which it is a reflection) and, as such, can be likewise optimized through practical investments to reduce external and internal failure costs. With any sort of resolution or plans for improvement, there are challenges to overcome. “Why is it so hard to find the motivation to change when we already know that we need to change? It’s painful to change. It’s uncomfortable. It’s difficult. And avoiding pain is innate. It comes standard in all human models.” Why Change Is So Difficult (and 9 Ways To Make It Easier), Brock Henry. There is a tendency, because of these and other feelings, not to do anything until it becomes more painful to continue with the status quo than to change. Then, of course, something has to be done, and FAST! And when we rush, we all reach for the closest, silvery-est-looking bullets we can see. Instead, let’s endeavour to be as proactive as we can to improve our situation, while still getting the expected day-to-day (revenue producing) priorities checked off. For that to work, we need an approach that is as natural as possible and gives real returns with relatively short turnaround, while avoiding the need for hard investment and the eyes of skeptics until the results are streaming in. We need to avoid the basic barriers so start-up is easiest, get some improvement initiative success stories, build up measurable return on investment (ROI) from the benefits, give the changes visibility, and parley that into buy-in for more change. 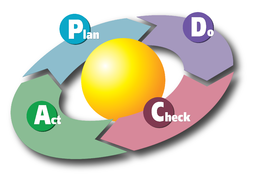 Based on the scientific method (hypothesis–experiment–evaluation), the Deming Cycle, also known as PDCA (plan–do–check–act or plan–do–check–adjust), is a straightforward, iterative, four-step approach for the management and continuous improvement of processes and products. This uncomplicated continuous improvement approach will integrate well within an Agile organization or otherwise. A group of collaborators drawn from the trenches of the typical functions of a project team can form an informal, self-organizing, Agile-like ‘PMO’. Their focus will be to collect, propose, and pilot new ideas for improving the process framework of the organization. Depending on the size of your organization or the scale or participation you seek out, this group could very well be your current team! The initial kick-off discussion can be time-boxed to an hour, or two at most, and should provide some common themes for where to propose improvements. “People who make resolutions are ten times more likely to change behaviour than those who have identical goals and motivation to change, but don’t make their list.” Dr. John C. Norcross, Global News. What happened during this last release/project? Are those things typical? What surprises or challenges did you face on this last release/project? How did you deal with them? Do you feel you did or did not impact the quality of the software that was released? When was the team at its best/most effective? When were you at your best/most effective? The quality of the software? The functioning of the team? Avoid doing in the future? And explore the ‘Why?’ for each. Note: It’s easy to get caught up in talking about what is not working, what needs to be fixed, and what changes need to be made. Including some questions in your discussion that will highlight the positives as well will help the team feel that they are building on something that is already working to some degree but could be better. Note: If you are bereft of ideas, then maybe you are doing great and all your projects are successful – That would be wonderful. Or, if you just need to shake up the idea generator a bit, you could take a look at standards like CMMI, SPICE, ISO, PMBOK, and similar as sources of ideas. Now you can analyze your list of collected input for potential solutions. Break the solutions into sensible steps (or stories). Prioritize them by opportunity/timing, return value, difficulty, dependencies, etc. Pilot them singularly or in small batches. Measure impact and collect feedback. Adjust and re-pilot or roll-out to the organization. Following an Agile-like approach with our Deming/PDCA Cycle, illustrated at a high-level below, seems natural and should integrate relatively seamlessly with whatever flavour of development methodology you are practicing. In every list of ideas for improvements there will be some “Quick Wins” that you can put at the front of the backlog and some bigger/tougher/more expensive ideas that you can leave until later. Starting the first few iterations with the Quick Wins shouldn’t require much effort to get buy-in or to implement. And, when implemented, they can pave the way for early benefits, success stories and generating that initial ROI to ‘fund’ the next round of improvements. Your initial list of improvements will no doubt take you a while to work through, and likely will spawn more ideas along the way. Remember, each idea you implement successfully is a step on the road of accomplishing your goals of process improvement. What is success for your project/organization/business? Why? What makes you different/special to your customers? What are the impediments to your being #1 in your market? Process should exist to provide a supporting framework to individuals and teams so they can get things done, while helping ensure a standard of quality in doing so; not to restrict people from being valuable/productive. Take a look and see what ideas you have for optimizing your investments in the processes you have. You may already be ‘spending’ more than you have to. This entry was posted in All, Planning for Quality, Team Building and tagged agile, people, process improvement, ROI, science & testing, software testing, survey. Bookmark the permalink.